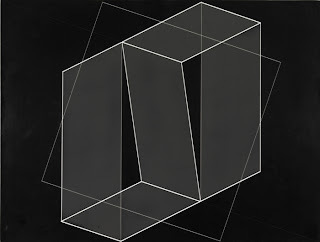 Mies and Duke Ellington make music "Under Glass"
Join the Mies van der Rohe Society to celebrate the 122nd birthday of Ludwig Mies van der Rohe, accompanied by the Duke Ellington Orchestra. Relive the golden year of 1957 and a concert originally played in Crown Hall by the Duke. Cost $40 – $75 per person. More info here. Reservations required by March 21st. Here’s the history: In 1957 Crown Hall was new. Chicago architect John Vinci was in the first class to study architecture there. The school had a tradition of an annual “I-Ball” dance and Vinci became one of those responsible for putting it on. Vinci and many of the Modernists loved jazz, although Mies did say, “when you improvise you must be very careful.” Vinci and his group booked Duke Ellington and his orchestra. The architecture students built a bandstand out of scaffolding, plywood and wooden forms used for concrete. It was nearly eight feet high, and they painted it all white. It must have been beautiful in Crown Hall. (I have not been able to find any photographs, but I’ll ask John Vinci again. Many of the Miesians took photos and I bet some exist somewhere of this event.) Vinci remembers that Duke Ellington and his band had to climb a ladder to get onstage. Students from the Institute of Design decorated Crown Hall that night and their main effect was to shine blue and green spotlights from outside the building, through the branches of the honey locust trees around Crown Hall, so that the shadows of the branches were seen inside the building, playing on the milk-glass that goes from the floor to above eye-level. I’ve seen that effect at Crown (though not with colored lights) most memorable a few years back when the buidling reopened after a renovation. IIT shone spotlights through the branches, and on the inside it makes the milk glass look more than ever like living Japanese screens. (I have photos of this effect taken recently, I’ll post one soon.) Crown’s glass always has that effect, even during the day. Supposedly Duke Ellington enjoyed himself so much that night that he wanted to return to Crown Hall to record an album. It was to be called “Ellington Under Glass,” – a great name – but that never happened. And students such as John Vinci remember Mies that night, sitting in a Barcelona chair, with a cigar, enjoying the evening. Crown Hall. Hear the music? Ludwig Mies van der Rohe. (American, born Germany. 1886-1969). Concert Hall Project, Interior perspective. Graphite, cut-and-pasted photoreproduction, cut-and-pasted papers, cut-and-pasted painted paper, and gouache on gelatin silver photograph mounted on board, 29 1/2 x 62″ (75 x 157.5 cm). Mies van der Rohe Archive, gift of Mrs. Mary Callery. The comparison is not so far-fetched. 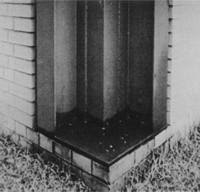 We know Mies, like Robert Irwin, was above all avant-garde. Mies’ use of collage to present his architecture, in 1942 and earlier, is radical. Mies was friends with Dada artists and worked with the progressive design magazine “G” whose contributors included El Lissitzky, Walter Benjamin, Man Ray, Georg Grosz, Kurt Schwitters, Piet Mondrian, Constantin Brancusi and Fernand Léger. ….The design is a montage of sepia prints made from a Life magazine color photograph of the 1952 Republican Convention… (Notice) the signs for (Republicans) Ike and Taft. Somewhat more ominous are the posters, like the one in the foreground just to the left of center, that say “Impeach Earl Warren,” the nemesis of conservatives in the McCarthy era. 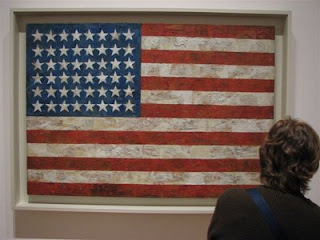 Jasper Johns. (American, born 1930). Flag. 1954-55 (dated on reverse 1954). 42 1/4 x 60 5/8″ (107.3 x 153.8 cm). Gift of Philip Johnson in honor of Alfred H. Barr, Jr.
and which, as much as anything else, returned the question of representation to the forefront of contemporary critical discourse while seemingly leaving the issue of politics up in the air. The choice of a Republican imagery for a city controlled by Democrats, for a project sponsored by a municipal authority, in the same year that the Democratic party itself nominated Illinois’s own governor Adlai Stevenson as its party’s presidential candidate – for whom Mies, a naturalized American citizen since 1944, himself voted – renders the issue of interpretation complicated indeed. For sure, Mies did not intend the work to have a specific, literal meaning in the context of contemporary affairs. It is neither pro-Republican nor anti-Republican, on the surface of things. But there is, as (Franz) Schulze noted, a “poetically representational” layer of meaning, one that Arthur Drexler earlier on described as “bring[ing] architecture into the realm of heroic enterprise” to create “the most monumental image twentieth-century architecture has yet produced.”” Clearly signifying something beyond mere space or structure, the collaged imagery of the Chicago Convention Hall condenses, into what is arguably the most powerful political statement of architecture conceived in the Cold War era, a visual representation of the core symbolic moment of the American democratic political process, at the scale of modern technology and in the terms of modern mass culture. 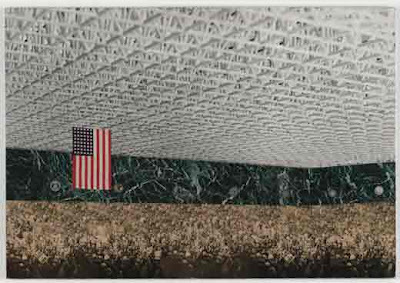 Neither explicitly celebratory nor overtly critical, the collage blurs the boundaries between those two poles – as it submerges the crowd of people beneath the deep walls and roof structure – to work across the entire spectrum as a stringent diagnostic. Less is more when less is the sum total of more. In 2006 Robert Irwin gave a talk called “Less is More Only When Less Is the Sum Total of More.” In April of that year he gave the talk in Crown Hall – the Architecture school that Mies van der Rohe designed at the Illinois Institute of Technology. 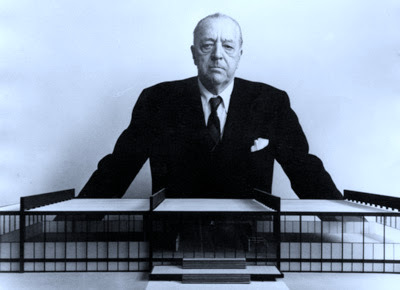 Mies standing over a model of Crown Hall. Shimmers. Corb’s relationship to the ground is always interesting, so this posthumous placement of a Gonzelez-Torres opus, one even with the word “landscape” in the title, works well in the Carpenter Center. 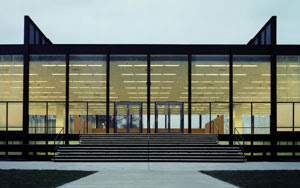 Of course, I’d also love to see it in Mies van der Rohe’s Crown Hall at the Illinois Institute of Technology! Mies’s works also bear an interesting relationship to the ground. The Mies Society, and IIT’s College of Architecture are producing art in Crown Hall, including a collaboration with Hubbard Street Dance Chicago. IIT architecture students are working on designs and environments for dances. They’ll premiere in Crown Hall on January 25 and 26th – by invitation only. The first public performance will be January 27 at 5:00 pm. And of course, the lobby of Lever House, as of tonight, is filled with 30 dead sheep, one dead shark, two sides of beef, 300 sausages, and a pair of doves. We had a blast yesterday linking Mies and Rem at Jim Coudal’s Seed Conference. Great people, great confab. Straightforward smarts. Don’t miss the next one. We talked about how Mies designed most of the campus where the conference was held – the Illinois Institute of Technology. And how he refined his vocabulary there until he was able to create a masterpiece, the school of architecture, Crown Hall. We talked about the building we were in – Rem Koolhaas’ Student Center. And about how Rem (“I don’t respect Mies. I love Mies”) responds to Mies in his work. which I’d just looked at for three days in the entrance to the Yale University Art Gallery (by Louis Kahn.) With the light I saw, I knew I was in for something special in Crown. I entered Mies’ “temple” – his glorious, floating, center-less space. I’ve been hundreds of times and had never seen it as it was on this glorious late October day. Light reflected up from the floor onto the ceiling, which “floated” more than usual. Long, gorgeous shadows were cast from the south, into the central space, also reflected upwards. The facade – a Mondrian-like composition of distant, middle and close view; present and future; real tree, symbol of tree; permeable, less permeable. Beautifully and rhythmically composed. So thanks to Coudal.com for bringing me back to Chicago, for a day, and to “the temple.” Here’s how Jim Coudal feels about Crown Hall. 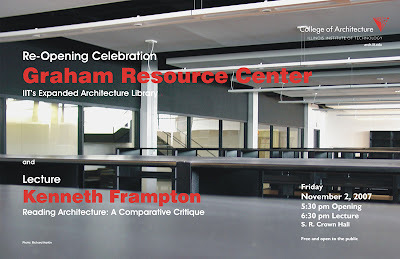 And if you’re in Chicago, don’t miss Kenneth Frampton lecture on “Reading Architecture: A Comparative Critique” in Crown Hall on Nov. 2 at 6 pm. I hope the light is stunning for you. Even if not, Frampton will be! Which reminds me, since I just heard Kenneth Frampton lecture at Yale on the work of Japanese architect Tadao Ando (my favorite living architect?) I’d like to see IIT commission Ando, who also worships Mies, to design a building for the campus. If you’re going to build, as IIT is, get the great ones. Kind of like if you’re going to build on the Acropolis, as they just have. Well isn’t Crown Hall the modern Parthenon? I’m sure Ando would love to do it. The question is, would he reduce his fee low enough to be affordable to IIT. As IIT builds, let’s develop a series of buildings of the highest quality, responding to Mies. He can stand up to them all. Who would you have design for IIT? Crown Hall in the Summer Solstice. The sun rising in the east. You see how straight and perfect are the reflections today. And the sun, due west, just after noon. Che bella. More to follow. Farnsworth too. That great ‘Japanese’ architect, Mies van der Rohe. At Crown Hall, especially since the restoration, the translucent glass looks like Japanese screens. The shadows of twigs dancing on them from behind are living calligraphy. One of the joys of living in a Mies building is its zen-like simplicity, derived from a sensitivity to space and materials, and pared down seemingly over many lifetimes. in which the great photographer of modernism, Werner Blaser, posts a photo of a work by Mies and on the facing page, a photo of a piece of architecture in Japan. They are enchantingly similar. The Mies van der Rohe Society presents an exhibition created by Swiss architect and author Werner Blaser opening June 16. Ten pairs of large-scale black and white photos by Blaser compare the work of pioneering Western architect Mies van der Rohe and the building traditions of the East. Blaser has published 101 books, 15 about Mies or his buildings. He is a former student and colleague of Mies’. 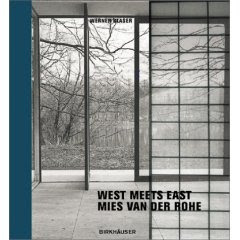 West is East is West / Mies van der Rohe runs through July 29 at the Mies masterpiece, S.R. Crown Hall, 3360 S. State St., Chicago. Hours are 10 a.m.- 3 p.m. daily. Admission is $5.00, or free for those taking the tour of campus. Lucky us, the exhibition will be right there- in the temple – Crown Hall. Some snaps from the birthday party at Crown Hall. Hey, if you can’t have fun with Mies, who can you have fun with? And all around us, the architecture students worked. That’s the way it should be, ja? What happened to the woman who wanted to meet me there? Looking like Miesian windows, seed packets appear in the stores. You are currently browsing the archives for the Crown Hall category.